The Ogre came out of his house near downtown Wasilla, Alaska yelling at us and threatening us by waving a hatchet high over his head. When I was 10 years old we lived off the Goose Bay-Knik Road near Wasilla back in the 1950's when it was still a small, two lane gravel-covered dirt road. One Saturday afternoon our family drove into Wasilla and parked our car near the Wasilla Bar. Dad went into the bar, followed by mom, while my sister Anna went to a near-by friend's house and me and my brother Tom went to our friend's house. When my brother and I got to our friend's house, the three of us decided to go for a walk on a dirt road near the Wasilla Elementary school. Down the side of the hill across the street from the school were some houses. One of the houses had a great big round oil tank next to it. Our friend told us that a really mean man lived in the house. A moment later, our friend picked up a rock off the side of the dirt road and threw it at the oil tank. "Boink" went the shiny oil tank when the rock struck it. My brother and I couldn't believe what our "friend" had done. We had been taught better than that, so we told him not to do that again. His response was to pick up two more rocks and throw them even harder at the oil tank. "boink, boink" the two rocks struck their target. A second later a very angry man came out of the house yelling at us and screaming "you trying ta splode me?" He then darted back into his house and came out a couple of seconds later. This time he was yelling at us while waving a hatchet high over his head. Then the man became furious and started climbing up the hill toward us, hatchet in hand. Our so-called friend quickly turned and ran away. A second later, my brother Tom ran away leaving me to fend for myself. As the Ogre made his way up the hill, I was scared, but I hadn't thrown any rocks, so surely he wasn't after me. But as the Ogre got closer, I could see that his eyes were red with anger and that puffs of pale green smoke were spewing from his flared nostrils. At that moment it occurred to me that the Ogre didn't care whether I had thrown a rock or not. I was guilty by association. So I turned and ran. But that morning I had put on my dad's work boots and they were much to big for me. As a result, I was not able to run very well or very fast. As I ran, I turned to look over my shoulder to see where the Ogre was at that moment. Much to my horror, the Ogre was right behind me with his left arm stretched out and his left hand grabbing at me while his right hand continued to wave his hatchet. I suddenly became jet propelled and bolted forward just like the RoadRunner cartoon. In no time I whizzed passed my brother and moments later I zoomed past our "friend." As I rounded the corner to the left I could see the Wasilla Bar and our family vehicle. Back in those days we didn't have to lock our cars, so I headed straight for the back door of our car, grabbed the door handle, jerked the door open and dove head first to the floorboard where I began crying and sputtering about the Ogre and his hatchet. A few moments later Tom opened the back door and threw himself belly first onto the back seat. Then Tom and I both started wailing and sobbing about our all too close encounter with the Wasilla Ogre. Our so-called "friend" must have ran all the way back home because he was nowhere in sight. In about ten minutes I got brave enough to lift up my head so I could peek out the window to look for the Ogre who was nowhere in sight. Right then and there, my brother and I quickly made a pact to never speak with or hang out with the "fool" we had once thought was our friend. 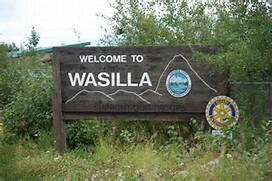 We never saw the Wasilla Ogre again, although we never forgot him or his hatchet. If you have a friend who taunts Ogres, run away and let your friend deal with the Ogre's wrath. And if you're wearing your dad's work boots that are much too big for you, pray that the Ogre has very poor eye sight and bad knees. Frightening. I can just see all of you running away. You must have been surprised when you saw him right behind you.